On 6 April 1994, the Hutu presidents of Rwanda and Burundi, their top military staff and six French crew members were assassinated when surface-to-air missiles shot down the Rwandan presidential jet on approach to Kigali airport. It is now well established that the assassination plot that decapitated the Hutu-led governments was executed by Rwanda’s now president and strongman-for-life, then Major General Paul Kagame, commander of the terrorist Tutsi-Hima army that invaded Rwanda from Uganda. Now, 25 years later, while Kagame and the Rwanda genocide industry commemorate the 25th anniversary of the so-called 100 days of genocide, U.S. taxpayers continue to pay millions of dollars for yet another bogus asylum show trial targeting another genocide survivor and fugitive from the terrorist Kagame regime. Meanwhile, reporting on the trial in federal court in Boston, Massachusetts, the Boston newspapers have not challenged the vested-interests of their quoted sources or the machinations of the Department of Homeland Security and its Immigration & Customs Enforcement. 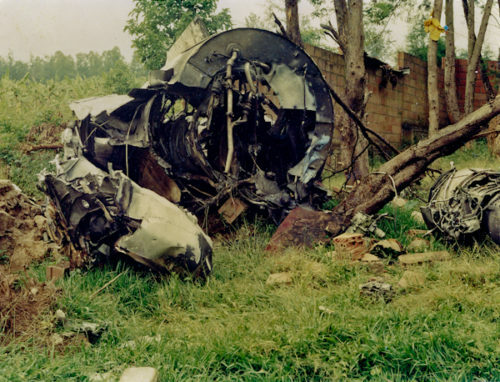 The wreckage of the presidential Mystere Falcon airplane, shot down on approach to Kigali airport on 6 April 1994, at rest after air-to-surface missiles caused it to crash into the presidential compound. Photo by Cranimer, New Vision newspaper, Kampala, Uganda. Jean Leonard Teganya, 46, is a wanted man who has spent much of his adult life trying to start over and recover from the atrocities he survived in Rwanda. Teganya was a medical student who volunteered at the hospital in Butare, Rwanda in the spring of 1994, treating the sick and wounded when no doctors or nurses were available (due to the large numbers of casualties). Mr. Teganya was also a victim of the violence in 1994, rescued by fellow students after being attacked by an armed militia in Butare. He fled Butare around 20 June 1994, after killings intensified in the region in parallel with the arrival of the Rwandan Patriotic Army. In June of 1994 Mr. Teganya fled Rwanda during the mass exodus of some 2 million Rwandans to neighboring countries. Mr. Teganya ended up in Zaire (now the Democratic Republic of Congo) at Nyakavogo, a (mostly) Hutu refugee camp that in September of 1996 was attacked by Paul Kagame and the Rwandan Patriotic Army (RPA) in violation of international humanitarian law. A trial in a federal court in Boston commenced against Jean Leonard Teganya on 11 March 2019. Photographs of the scars of his wounds were shown to the Boston jury by the attorneys from the public defenders office that are representing him. Witnesses for the prosecution, flown in from Rwanda for the trial in Boston, swore under oath that Mr. Teganya wore the hats, shirts and scarves of the ‘extremist Hutu’ parties. Prosecution witnesses described in great detail the insignia that was on Mr. Teganya’s hat: a machete and tool. He helped commit genocide, the U.S. prosecutors and immigration agents in Boston said, then tried to claim asylum. More than two weeks of hearings later, witnesses for the defense described Mr. Teganya as an amicable, quiet man devoted to helping other people. They described an intelligent, sensitive and caring fellow student who did not participate in party politics. More than 15 witness stated under oath that Jean Leonard Teganya never wore the signature clothing of the more radical Hutu political parties. Where and how were the Rwandan prosecution witnesses to Mr. Teganya’s alleged crimes identified and who identified them? These are some of the pivotal questions that an ICE agent on the witness stand at Mr. Teganya’s trial was unable or unwilling to answer with conviction. Did the ICE agent commit perjury? As the cataclysm unfolded in Rwanda in 1994, the western media reported from behind the RPA lines. The RPA narrative became the mainstream establishment narrative (that remains the predominant one): Tutsis as victims, Hutus as killers. When the United Nations High Commission for Refugees special rapporteur Robert Gersony reported on the RPA’s widespread killing of scores of thousands of Hutu inside Rwanda, the report was squashed: all Hutus were killers, all Tutsis were victims. Gersony went silent and stayed silent. As a survivor of the mass atrocities and genocide that occurred in his home country of Rwanda during the civil war, Jean Leonard Teganya was one of millions of innocent non-combatant Rwandans uprooted and driven from his homeland. Forced to flee at the age of 21, from one country to another, he was for all practical purposes a fugitive from injustice (at the hands of the RPA), forced to survive or perish under the constant nagging memory of the horrors that he witnessed and the threat of arrest and persecution by the current regime in Rwanda. His real crimes? He is a Hutu. He is an intellectual. He is a survivor. He had a U.S. government issued work permit and (for over two years) he was working at a prestigious university. Mr. Teganya persevered in finding a new home, building a new life, raising a family. And the worst crime of all? Jean Leonard Teganya was on the path of gaining asylum in the United States of America. When president Paul Kagame and his Directorate of Military Intelligence in Rwanda learned that Mr. Teganya was legally employed as a laboratory technician at the Massachusetts Institute of Technology in Cambridge Massachusetts, and that Mr. Teganya was about to gain legal U.S. residency status through the formal immigration process, they set about manufacturing a case against him. The RPA slaughtered hundreds of thousands of unarmed non-combatant Rwandans–mostly Hutu women, children and elders–and also uncountable Congolese citizens during the Rwandan and Ugandan invasion of Zaire in 1996 and 1997. At the height of the slaughter in Zaire, the New York Times and other major international media published story after hand-wringing story that basically manufactured consent for the ongoing genocide against the unarmed innocent Hutus in Zaire. 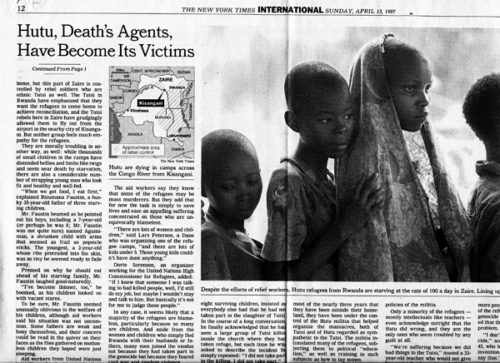 The New York Times article of 13 April 1997 that basically gave the green light for the continued massacres of innocent non-combatant refugees in Zaire–mostly women, children and the elderly. On 1 October 2010, the 20th anniversary of the RPA invasion of Rwanda (1 October 1990), the United Nations published an extensive Mapping Report of atrocities in the DR Congo. The Mapping Report established clear patterns and documented atrocities declared to include war crimes, crimes against humanity and genocide committed by the RPA and its allies. Zaire (the Congo) was not the first place that Hutu refugees experienced massacres, torture and unimaginable brutality at the hands of the RPA. The Hutu people also experienced atrocities of this unimaginable and unprecedented inhuman scale, magnitude and character during the four years of terrorism and war prosecuted by the RPA in Rwanda. Jean Leonard Teganya’s flight from Rwanda in 1994 led him from Zaire to India to Canada. Jean Leonard Teganya, 46, was charged with one count of immigration fraud and one count of perjury. Teganya made his first appearance in federal court in Boston on Friday afternoon. As alleged in court documents, approximately 800,000 people were murdered during the Rwandan genocide in 1994. Prior to and during the Rwandan genocide, Teganya was a medical student and medical trainee at the Butare hospital in Butare, Rwanda. Several witnesses present in Butare during the genocide described Teganya as active in the political party of the genocidal regime, the MRND, and its militia, and stated that he actively participated in the persecution of Tutsis, the group that was largely targeted during the genocide. According to court documents, Teganya left Rwanda in mid-July 1994, and traveled to Congo, India, and then Canada. In 1999, Teganya applied for immigration benefits in Canada. Canadian authorities twice determined that Teganya was not entitled to those benefits, and ordered his deportation because he had been complicit in atrocities committed at the Butare hospital during the genocide. After 15 years of litigation, Teganya evaded the order of deportation and fled across the border into the United States. On Aug. 3, 2014, Teganya was encountered walking on foot after he crossed from Canada into Houlton, Maine. Teganya was taken into custody and later made false statements on documents submitted to U.S. authorities by failing to disclose the extent of his affiliations and activities with the MRND and Hutu extremists. If you were to read only what was written about Jean Leonard Teganya by the Boston Globe and the Boston Herald in the years, months and weeks that preceded the trial, or the stories that appeared after the trial began on 11 March 2019 and before closing arguments were heard on 3 April 2019, you would be convinced that Jean Leonard Teganya is a monster of human being capable of the most sadistic violence. “Asylum trial portrayed a monster. Defense aims to change the narrative,” reads Maria Cramer’s Boston Globe article of 2 April 2019. No matter the stories’ leads, most of these articles quickly spin off into the never-never land of established lies, false accusations and manufactured evidence that are peculiar to Rwanda genocide asylum trials held in the United States and Canada over the past 20 years. Like the select group of Kagame agents and regime insiders that peddle them, these falsehoods, tactics and methodologies of oppression have become the staple mechanisms and tools of strong-arm long-arm authoritarianism used to reach outside Rwanda and silence, terrorize and extradite (from the U.S., Canada, U.K., Netherlands, etc.) any Rwandan that in any way challenges the Rwandan regime. When all else fails, there is always the RPA assassination program. In March 2019, Paul Kagame publicly and unapologetically bragged about the necessity and righteousness of the assassination of former RPA/RPF cadre member Seth Sendashonga–assassinated by RPA agents in Nairobi Kenya in the late 1990’s. On the U.S. side, working for the dictatorship in Rwanda, and keeping tabs on Mr. Teganya from the moment he entered the U.S. in his quest for asylum, crossing the U.S.-Canadian border in Maine in August 2014, was Brian Andersen, a special agent with U.S. Department of Homeland Security (DHS), Customs and Immigration Enforcement (ICE), Human Rights Violators and War Crimes Unit. Brian Anderson testified at Jean Leonard Teganya’s trial in late March 2019, and he is cited by the Boston Globe without any due journalistic diligence or even a modicum of investigative reporting to vet or uncover the truth about Anderson’s history and practices used to hunt down supposed genocidaire fugitives. “Brian Andersen, a special agent for the Department of Homeland Security, which investigated the case, testified that his team found the witnesses in Rwanda and established contact with them,” wrote Maria Cramer, for the Boston Globe on 1 April 2019. No April fool’s joke, what the Globe did not report is how special agent Mr. Andersen has worked with the Kagame regime to hunt, frame and persecute many Rwandan Hutus, survivors of the cataclysm of 1994. Special agent Andersen has been involved in at least four previous high profile but bogus Rwanda genocide asylum cases, two of these in Boston, one in Manchester New Hampshire, and one in Utah. Expert witnesses for the prosecution in several of these cases have included Dr. Phil Clark, a British academic at London’s School for Oriental and African Studies (SOAS), Zachary Kaufman, an academic at the Kennedy School of Government, and Rony Zachariah, a doctor with Medecines Sans Frontieres (Doctors Without Borders) who was present in Rwanda for a short spell before being evacuated during the atrocities of April 1994. Each of these three experts has made a career out of whitewashing the crimes of the Kagame regime through publishing, public speaking, and/or testifying at one-sided Rwanda genocide tribunals or asylum hearings. Dr. Phil Clark has been discredited by his own peers in the international academic community. Clark has for many years maintained friendly relations with Kagame and peddled the RPA narrative in complete disregard of evidence of the RPA’s crimes to the contrary; Clark’s tight relations with Kigali suggest some significant financial or material reward for helping to spread the propaganda of the regime. In the October 2017 immigration trial of Prudence Kantengwa adjudicated by Federal Immigration Judge Sanchez, federal prosecutor Mary Kelley succeeded in getting Dr. Phil Clark qualified as an expert: the immigration judge dismissed Clark’s direct ties to the Kagame regime. Dr. Clark testified by videoconferencing from London; he was allowed to refer to his notes, even search the Internet–while under oath and on the virtual witness stand–to buttress his testimony. Witnesses for the defense were required to appear in Boston in person, and Judge Sanchez disallowed Rwanda scholar Dr. Susan Thomson as an expert witness for the defense, claiming that Dr. Thomson’s testimony would be duplicative of issues addressed by Dr. Phil Clark. In fact, based on her multiple highly critical reviews of the genocide text edited by Dr. Phil Clark and Dr. Zachary Kaufman (see below), Dr. Susan Thomson would likely have offered testimony in strong contradiction to the prosecution’s expert witness Dr. Phil Clark. Defense witnesses who did appear at the Kantengwa hearings were not allowed to surf the Internet, refer to documents or books, or even access their personal notes while giving testimony. Federal prosecutor Mary Kelly harassed the two leading defense witnesses (Keith Harmon Snow and Claude Gatebuke) that Immigration Judge Sanchez did qualify as experts. Ms. Kelley attempted to intimidate, stifle or completely silence the witnesses. In the Kantengwa case, Immigration Judge Sanchez found in favor of Rwanda and its collaborator, the U.S. Department of Homeland Security, and thereby set the stage for the extradition and deportation to Rwanda of Prudence Kantengwa. In the appeal brief filed by Kantengwa’s defense attorneys (William Joyce, “Brief in Support of an Appeal of an Immigration Judge’s Decision,” filed in Falls Church Virginia, A 098 277 297) the appeal attorney explicitly flagged the unprofessional and immature behavior of federal prosecutor Mary Kelley, both in the context of her hysterical outbursts and harassment of the two qualified defense experts and in the context of Prudence Kantengwa’s initial immigration trial adjudicated by U.S. Federal Judge Klein. Judge Klein, who initially heard Ms. Kantengwa’s case, noted for the record in her written opinion the DHS trial attorney’s [Mary Kelley’s] lack of respect for the court and unnecessarily combative questioning of Ms. Kantengwa and her witnesses. Tr. #1 at 1242 (“I want whoever reviews this case to listen to the tone of this trial attorney [Mary Kelley] throughout this case.”); id. at 1250 (Judge Klein to attorney Kelley: “…it gets to the lack of respect that you have for this Court…”); IJ Klein Dec. at 48 (“On various occasions during cross-examination, DHS counsel’s tone toward the respondent was accusatory and aggressive.”). This aggressive questioning continued in Ms. Kantengwa’s hearings before Judge Sanchez, in part leading to the reticence of witnesses to respond to questioning…(DHS accusing Ms. Kantengwa of violating and ICTR sequestration order)…(DHS likening Ms. Kantengwa to a Holocaust denier)…(DHS accusing Mr. Gatebuke of misrepresenting his identity)…(DHS accusing Mr. Gatebuke of having a bank account in the Caymans)…(DHS comparing Mr. Snow to Adolph Hitler)…(bond counsel for Ms. Kantengwa to DHS: “I don’t know why your [sic] harassing [the respondent].”) The end result of this very aggressive and possibly inappropriate line of questioning plus the investigator [ICE special agent Brian Andersen] running in and out of the court room led to an atmosphere of intimidation both to the experts and to the respondent. Though a seasoned Judge from another court arena, Judge Sanchez was newly appointed to the Immigration Courts and the trial of the United States v. Prudence Kantengwa was one of the first immigration cases he heard. Ms. Kantengwa’s appeals attorney also noted the conflict that arose in the court when a defense witness refused to reveal his sources. Defense expert [Keith Harmon Snow] testified that he had interviewed a Rwandan genocide survivor who had witnessed crimes against humanity and who was himself the survivor of severe and inhuman forms of torture committed by the Rwandan Patriotic Army. Judge Sanchez asked the expert [Snow] to reveal the name of witness/victim and when the expert repeatedly refused to name the source or provide to the Court any video or audio recordings of said victim’s statement, Judge Sanchez ruled that the expert’s [Snow’s] opinions on torture in Rwanda be stricken from the record. In his decision, Judge Sanchez afforded less weight to the expert’s [Snow’s] testimony on the grounds that he was “non-responsive to DHS questioning” and he refused to provide the names of sources to the Court upon demand. During the trial, attorney William Joyce, the defense counsel for Prudence Kantengwa, strenuously objected to the requirement that experts require names of sources, particularly given the presence in the courtroom of the ICE agent — Brian Andersen — who conducted an investigation in Rwanda of Ms. Kantengwa and her sister Beatrice Munyenyezi. In fact, there is a serious question as to whether the ICE agent [Brian Andersen] sitting at the [prosecution] table who was also running in and out of the courtroom and providing information to government counsel was attempting to intimidate Mr. Snow. In fact, the respondent’s counsel requested an off the record discussion to discuss what could be considered possible intimidation towards Mr. Snow. The tactic used by Mary Kelley and Brian Andersen of targeting innocent Rwandans who showed up at hearings in support of other defendants or respondents, or who have been named or identified in immigration hearings, is not without precedent, as noted above. Dr. Zachary Kaufman, who is Dr. Phil Clark’s academic and editorial colleague, has also maintained a tight relationship with the Kagame regime, effectively serving as one of Kagame’s hired guns. Dr. Clark’s relationship involves material and financial rewards in exchange for whitewashing the regime and gaining access to the country and the largess (and privileges) secured by the criminal RPA cadres and their illegal networks in Rwanda and Congo. Paul Kagame has numerous times been invited (and appeared) as speaker at the Harvard University Kennedy School of Government where Kaufman and genocide expert and stateswoman Samantha Power both have deep historical and current ties. Like Clark and Kaufman’s publications, Samantha Power’s publications on ‘genocide in Rwanda’ are laden with inaccuracies, omissions, distortions and selective truths. Clark and Kaufman published an edited volume titled After Genocide (2009) that was criticized by Dr. Susan Thomson, a Rwanda scholar whose professional work and vocal criticisms of the regime lead to her being declared persona non grata in Rwanda. Thomson and other scholars also signed a public letter criticizing Dr. Phil Clark’s work and his ties to the Rwandan government. Thomson’s dislike of the Cark/Kaufman book was so strong as to provoke her to write not one but two book reviews that were subsequently published in academic journals. The preface of After Genocide was written by Paul Kagame and, besides a few chapter contributions by Clark and Kaufman (and a collection of more honest and professional academic chapters), there is also a chapter by another of Paul Kagame’s leading hired guns, the English-speaking propagandist Tom Ndahiro. Recall that the Tutsi aristocrats and their Ugandan brethren who invaded Rwanda were English speakers, while the Tutsi that suffered the genocidal onslaught in 1994 were French speakers. Kagame and company did not trust, or care about, French speaking Tutsis who ‘stayed behind’ in Rwanda in the 1960s and 1970s when the Tutsi aristocrats fled, and when so many innocent Tutsis targeted in retaliation for Tutsi guerrilla (Inyenzi) attacks against Rwanda also fled to neighboring countries. Zachary Kaufman was quoted in one of the main Boston Globe articles about Jean Leonard Teganya. Reporter Maria Cramer brought Kaufman into the story to provide an official authoritative and definitive quote to repudiate the defense attorney’s demonstration that Rwandan witnesses for the prosecution are coached, and the defense team’s demonstration of witnesses’ inconsistencies. In 2012, Prudence Kantengwa, a Hutu, was sentenced to 21 months for lying on her asylum application about her affiliation with the party that orchestrated the genocide, the National Republican Movement for Democracy and Development. Three years later, Kantengwa’s sister, Beatrice Munyenyezi, a Hutu mother of three who had moved to New Hampshire, was sentenced to10 years for lying about the killings and rapes she ordered as head of a roadblock in Butare, where Tutsis were stopped, checked for identification, and often murdered on the spot. Like Teganya, Munyenyezi argued that the witnesses against her were motivated by the possibility of financial compensation or by fear of the Rwandan government. But other scholars of the genocide said they are skeptical that the government has interfered with witnesses’ testimony. At least one of the Rwandan witnesses for the prosecution in the Teganya trial has appeared in court for more than one of the cases ‘investigated’ by ICE special agent Brian Andersen. Witness statements show remarkable similarity in the kinds of details they provide and, under cross-examination, in the omissions or contradictions of their testimonies. The reasons and process whereby Rwandan Hutus have come under the gaze of special agent Brian Andersen are very irregular, if not illegal, and the four previous cases are all interconnected. Mr. Andersen is not alone in the decision-making process that has led to the expenditure of millions of dollars for each of the five cases to be explored herein. Mr. Andersen’s ally in hunting down and persecuting innocent Rwandans in the United States includes Boston federal prosecutor Mary Kelley. What the Boston Globe also did not report about special agent Andersen is that the Federal Court in Utah found against the Department of Homeland Security and the efforts of Brian Andersen, after the judge in the case realized that the investigation had been botched, the evidence fabricated. Special agent Andersen and prosecutor Mary Kelley have deployed what has become standard boiler-plate language, tactics and the production of fraudulent witnesses, in the pursuit of ‘justice’ meant to satisfy the dictatorship in Rwanda and silence its critics. Mr. Andersen and other agents have traveled frequently to Rwanda, where there is no possibility of independent research or investigation, and where ‘witnesses’ are often produced by or coerced by the Kagame regime into satisfying its interests of suffering the repercussions of violence against themselves or their families. In other cases, witnesses are promised lenience on their prison sentences or financial rewards for their cooperation. Some witnesses agree to testify to settle old scores. “Did the government of Rwanda play any part in selecting the witnesses?” the Boston Globe on 1 April 2019 reported that Assistant U.S. Attorney Scott Garland asked Andersen this question under oath. “No, they didn’t,” Andersen replied. Of course they did. Did special agent Thomas Brian Andersen commit perjury? Under cross-examination on the witness stand at Mr. Teganya’s trial in Boston, special agent Brian Anderson was asked how he found the Rwandan witnesses who testified to Mr. Teganya’s alleged crimes. Special agent Andersen faltered, badly. The Boston Globe did not report on special agent Brian Andersen’s poor performance under cross-examination. Brian Andersen committed perjury, and it is not the first time. What happened in Utah? Finally, after hearing some truthful testimonies by defense witnesses, and under the byline of reporter Laura Crimaldi, the Boston Globe began waking up and reporting about Jean Leonard Teganya’s character and the ordeal he survived with greater accuracy and depth. During much of the 100-day Rwandan genocide in 1994, Jean Leonard Teganya said, crowds of victims assembled each day outside the teaching hospital in Butare — overwhelming medical staff with the severity of their wounds. A month into the violence, Teganya, a Hutu and then a third-year medical student, said he, too, became a victim. Attackers beat him over the head and slashed his leg and ankle with a machete in a secluded area near his dormitory, he said. Answering questions from his defense lawyer for about three hours, Teganya delved into his life story for the jury, discussing his Tutsi mother, his education at a Catholic seminary and medical school, and the chaos at the hospital in Butare, the country’s second-largest city. While Jean Leonard Teganya was helping the sick and wounded in Butare, and throughout the four year war, the Rwandan Patriotic Army (RPA) was perpetrating massive war crimes and crimes against humanity against anyone in their warpath. From 1990 through 1993, the RPA’s scorched earth policy decimated entire villages in northern Rwanda, and this is where the RPA began its slow march to conquer territory across Rwanda. As the RPA continued its steady war of terrorism, hundreds of thousands of refugees were uprooted from homes and villages, forced to become refugees in their own country. Northern Rwanda is an area of the country where the masses–mostly Hutu, but also some Tutsis and Twa–shared a collective history of generations of extreme violence and injustice suffered at the hands of the Tutsi aristocracy that once ruled the kingdom from central Rwanda. Paul Kagame and the other Tutsi guerrilla invaders from Uganda were raised on stories of how their noble Tutsi ancestors were the benevolent benefactors of the Rwandan masses. The masses in this case included the predominant Hutu population of over 80-90%, with between 10 and 10% Tutsi, and about 1% Twa. The ethnic categories take on little meaning when one begins to comprehend the nature of the Tutsi aristocracy, their client-patron relations, systems of reward and punish, shifting allegiances and alliances. The RPA was backed by powerful foreign allies, and their atrocities were whitewashed by the international media and the academics that have always peddled the Tutsis as victims narrative. This narrative was constructed in large part by the human rights establishment, following the lead of the London-based non-government organization African Rights. From 1990 on, RPA terror cells began infiltrating Kigali, the capital, and all other areas of Rwanda, and with them came atrocities that were frequently blamed on the Habyarimana government. These included assassinations, massacres and disappearances. By March 1993, Rwanda’s internally displaced persons (IDPs) population exceeded one million people. Hungry, homeless, out of work and money, suffering horrible trauma, despair and the sadness and grief of having lost family members whose lives (and deaths) were further defiled by the inability of survivors to property attend to burials and burial customs. The RPA practiced a scorched earth policy. They did not want to have to administer a territory or deal with local populations. The RPA displaced people and villages, shelled IDP camps, machine gunned huge crowds of people that they first lured into public spaces, and then they marched on. They killed some captives, buried them in mass graves, incinerated them in hugs ovens, baked them to death in tractor-trailer shipping containers, bulldozed them into the forests, and used survivors as porters to transport ammunition, dig trenches, cook their meals, serve as their sexual slaves, and they usually shot them in the end no matter. As the RPA occupation of Rwanda continued, the Hutu majority government of Juvenal Habyarimana was framed for genocide against Tutsis in Rwanda as early as 1993, while the RPA enjoyed increasing authority, power-sharing and impunity for the horrible and widespread atrocities that were being committed in broad daylight, under cover of night, in villages, in prefectures, across the country in the form of targeted assassinations and other dirty tricks. Trained at Fort Leavenworth, Kansas, Paul Kagame was schooled in art of ruthless, lethal, contemporary guerrilla insurgency. It is important to first realize that special agent Brian Andersen apparently has some kind of special mission to hunt down, arrest and extradite anyone that the Kagame regime accuses of participation in genocide. One of Mr. Andersen’s fellow Hutu hunter’s is the federal prosecutor Mary Kelley, also based out of Boston Massachusetts. Kelley and Andersen worked together to frame, arrest, prosecute and imprison Prudence Kantengwa (Boston, MA) and Beatrice Munyenyezi (Manchester, New Hampshire) the sisters of Jean Marie Vianney Higiro. Paul Kagame has been trying to get his hands on Jean Marie Vianney Higiro since Higiro fled Rwanda in 1994. The former director of the RWandan Office of Information (ORINFOR) during the Habyarimana regime, Higiro and his daughter, a U.S. citizen, were evacuated from Rwanda on 7 April 1994 by U.S. marines who escorted them to Bujumbura, Burundi, and then flew them to Nairobi Kenya on route to the USA. The trial of Beatrice Munyenyezi was also fraught with irregularities. One of these was the prosecution’s introduction of formerly highly classified satellite images taken by U.S. intelligence reconnaissance satellites during flyovers of Rwanda in June 1994. These photos were introduced by a Pentagon analyst. Their existence had never previously been disclosed. In his opening statements in a Concord, New Hampshire (USA) courthouse on February 23, 2012, federal prosecutor John Capin launched the U.S. government’s trial against a 41 year-old Rwandan so-called ‘genocide fugitive’ by wielding satellite photographs purportedly showing the road blocks where she “commanded extremist Hutu militia and ordered the rapes and killings of Tutsi” in Rwanda in 1994. 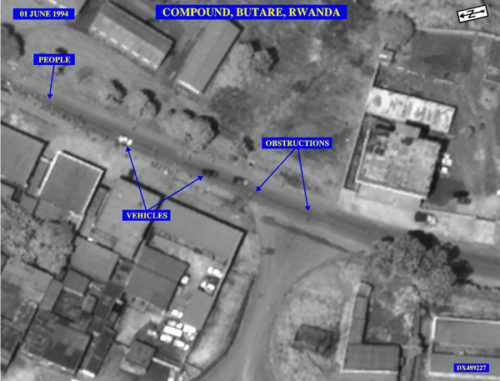 In a remarkable development, this is the first time in the history of the ‘Rwanda genocide’ trials or related Rwanda asylum hearings where Pentagon satellite photographs have been produced as evidence, and the first time that the existence of satellite photographs taken over Rwanda during the so-called ‘100 days of genocide’ has ever been verified. Later in the Munyenyezi trial the U.S. prosecutors produced a ‘Pentagon analyst’ who testified about the satellite photographs. The Pentagon analyst was Mr. Eric R. Benn, Technical Executive, Analysis and Production Directorate, National Geospatial-Intelligence Agency (NGA). The photographs introduced into the public record include very high resolution images shot over Rwanda in May, June and July of 1994. Under cross-examination during the Munyenyezi trial, the Pentagon analyst admitted that other photos–that would have exonerated the accused–existed, but after a hastily arranged court recess the analyst changed his story declaring that no such photos existed. Declassified Pentagon photos purportedly showing the location of (nonexistent) road-blocks in Butare that were produced in the case of United States v. Prudence Kantengwa. Brian Andersen played some role in advancing the false story of roadblocks in Butare, where Beatrice Munyenyezi was alleged to have been checking IDs to single out Tutsis to be raped or killed, and he thus played a role in framing Beatrice Munyenyezi. On June 22, 2010 a Search and Seizure Warrant was approved by the U.S. District Court in New Hampshire for the purpose of invading the Manchester N.H. home of Beatrice Munyenyezi. The warrant was based on the affidavit of Thomas Brian Andersen, Jr., the same ICE Special Agent involved in the case of Jean Leonard Teganya. In his affidavit, Andersen distilled the Hutu/Tutsi conflict in Rwanda down to a few essential details that helped to frame Beatrice Munyenyezi as a genocidaire. Beatrice Munyenyezi claimed she was a refugee from the Rwandan genocide,” wrote Boston Magazine. “Federal agent Brian Andersen suspected she was someone far more sinister. Compounding the injustice against Jean Marie Vianney Higiro and his family, ICE agents had Prudence Kantengwa arrested and tried for perjury based on the non-existent roadblocks story. When ICE agents interviewed Kantengwa, they claimed, she did not mention the roadblocks in Butare that became the pivotal (though falsified) evidence against Beatrice Munyenyezi. Kantengwa did not mention the roadblocks because they did not exist. Kantengwa was nonetheless adjudged guilty of perjury. Both Prudence Kantengwa and Beatrice Munyenyezi were denied exculpatory evidence and both remain in prison today. Prudence Kantengwa was further judged guilty of perjury on account of her alleged failure to mention that her husband, Athanase Munyemana, was a member of the MRND party. Note, this is one of the boiler plate accusations used against many Rwandans falsely accused by the regime in Rwanda and by the U.S. asylum courts. First, for decades Rwanda was a one-party dictatorship where membership in the government MRND party was obligatory. Second, Althase Munyemana was a state prosecutor in Rwanda who had been transferred to the Service Central de Renseignements (Central Intelligence Services). As a prosecutor, sent by a government minister to work for the CIS, Munyemana was forbidden by Rwandan law from joining any political party. Federal prosecutor Mary Kelley apparently also worked for Homeland Security, at which time she had both the Kantengwa and Munyenyezi cases referred to the District Attorney. Kelley was also the federal prosecutor in the case against Prudence Kantengwa. Kelley tried to connect Jean Marie Vianney Higiro to both of his sisters’ cases–to frame him as well. This was clearly a direct collaboration with the Kagame regime. In October 2017, during the Kantengwa trial, federal prosecutor Mary Kelley was forced to disclose a report written by one of her [the prosecution’s] expert witnesses that Kelley disclosed was funded by the Rwandan government. Working in some very irregular capacity as an “interpreter”, Ms. Mukeshimana is also some kind of special adviser to the federal prosecutors in Boston. Eugenie Mukeshimana has appeared in federal court every day, advising the federal prosecutors at the trial of Jean Leonard Teganya. Eugenie Mukeshimana has a substantial Internet presence, and she is known by rwandan nationals (with U.S. citizenship) for her pro-regime activism in political and legal circles in Boston, Washington, New York and New Jersey. Jean Marie Vianney Higiro remains under constant surveillance and monitoring by the Department of Homeland Security and Federal Bureau of Investigation. On 9 November 2016, the day after the U.S. presidential elections were decided, two F.B.I. agents appeared at the home of Dr. Jean Marie Vianney Higiro. This was only 12 hours after Donald Trump was elected. While the agents failed to observe protocol by reading Dr. Higiro his Miranda Rights, Dr. Higiro was nonetheless cooperative and invited the two agents into his home. He also answered all their questions for over an hour. The Obama administration had clearly made some deal with Paul Kagame, and it was time to clean house and tidy up unfinished business during the last days of Obama’s lame-duck presidency. Taxpayers in the United States should demand that a Federal Grand Jury be convened to investigate the corruption, perjury, racketeering and conspiracy being perpetrated in bogus Rwanda genocide asylum trials. How many scores or hundreds of millions of U.S. taxpayers dollars are being spent on these fraudulent trials? The fifteen-day trial of Beatrice Munyenyezi in February and March 2012 was concluded with four additional days of deliberations by an all-white jury. On 15 March 2012 the jury delivered a deadlocked decision and the U.S. government declared a ‘mistrial’. The re-trial began 10 September 2012. Mark Howard, one of Beatrice Munyenyezi’s attorneys, revealed to the press the huge sums of money spent by the U.S Judiciary to try Rwandan genocide suspects. Howard estimated that U.S. taxpayers paid between US$ 2.5 million and $US 3 million for Munyenyezi’s first 2012 prosecution and trial in federal court. Howard estimated (at the time) that the second 2012 retrial was likely to cost an additional US$ 1 million. Howard’s estimates include attorney fees, agent salaries, the ‘extraordinary expense’ of investigating in a foreign country, the costs of bringing some fifteen witnesses to New Hampshire, and the hiring of experts. In the case of Jean Leonard Teganya, some 15 witnesses appeared for the prosecution, with at least 18 witnesses for the defense. Most of these witnesses were flown in from other countries. The combined costs of the four or five trials mentioned herein must have (or will) exceed $15 million dollars. The investigation leading to Teganya’s arrest was conducted by special agents with U.S. Immigration and Customs Enforcement (ICE) Homeland Security Investigations (HSI) in Boston and supported by ICE’s Boston Office of the Chief Counsel and ICE’s Human Rights Violators and War Crimes Center (HRVWCC). Established in 2009 to further ICE’s efforts to identify, track, and prosecute human rights abusers, the HRVWCC leverages the expertise of a select group of agents, lawyers, intelligence and research specialists, historians, and analysts who direct the agency’s broader enforcement efforts against these offenders. Since 2003, ICE has arrested more than 380 individuals for human rights-related violations of the law under various criminal and immigration statutes. During that same period, ICE obtained deportation orders against and physically removed 785 known or suspected human rights violators from the United States. Additionally, ICE has facilitated the departure of an additional 108 such individuals from the United States. Currently, HSI has more than 160 active investigations into suspected human rights violators and is pursuing more than 1,750 leads and removals cases involving suspected human rights violators from 95 different countries. Since 2003, the HRVWCC has issued more than 70,400 lookouts for individuals from more than 110 countries and stopped 213 human rights violators and war crimes suspects from entering the U.S.
ICE special agent Brian Andersen appeared as an expert witness during an immigration hearing in Salt Lake City, Utah. On trial was a woman named Agnes Mukantagara, a Rwandan refugee who was forced to seek asylum at the U.S. Embassy in Kigali, Rwanda, after coming under threat by the Kagame regime. Agnes Mukantagara was working for the U.S. Embassy at the time of her falling out with the regime, and the U.S. Embassy facilitated her admission into the United States. Agnes Mukantagara appeared in Boston in an immigration hearing involving Prudence Kantengwa. Homeland security operative and federal prosecutor Mary Kelley spotted Agnes Mukantagara and Beatrice Munyenyezi sitting in the courtroom and Kelley pressed ICE to launch an investigation to find out who they were and ascertain their immigration status. On the witness stand at the Mukantagara trial in Salt Lake City, special Agent Brian Andersen reportedly admitted that Agnes Mukantagara’s case originated in Boston after she appeared in federal court as a witness in Prudence Kantengwa’s case. Andersen also reportedly said he was sent to Kigali to investigate Mukantagara. In Kigali, Rwanda’s national commission created to hunt down genocidaires provided special agent Andersen with an office where he could work and interview potential witnesses. The government commission brought witnesses to that office for special agent Andersen to interview–witnesses selected to provide Andersen with information that would serve the regime’s interests. Mary Kelley apparently used the information she so proudly discovered about Agnes Mukantagara, one convicted of genocide at a Gacaca Tribunal in Rwanda, to help make the case against Agnes Mukantagara, one who fled from the threat of the RPA to the U.S. Embassy in Kigali, in Salt Lake City, Utah. There are/were two Rwandan women with the name Agnes Mukantagara. Based on Kelly’s tip, the Rwandan regime set about to manufacture a dossier against Agnes Mukantagara. The whole case began in court in Boston, under the ever vigilant Hutu hunting eyes of prosecutor Mary Kelley and special agent Brian Andersen. After Brian Andersen’s testimony in Salt Lake City, under cross-examination by the defense, the judge found in favor of Agnes Mukantagara’s request for asylum, ruling against the Department of Homeland Security. The DHS, of course, immediately filled an appeal. Keith Harmon Snow is a war correspondent, photographer and independent investigator, and a four time (2003, 2006, 2007, 2010) Project Censored award winner. He is also the 2009 Regent's Lecturer in Law & Society at the University of California Santa Barbara, recognized for over a decade of work, outside of academia, contesting official narratives on war crimes, crimes against humanity and genocide while also working as a genocide investigator for the United Nations and other bodies. The first UCSB Regent's Lecturer, in 1960, was Aldous Huxley; other recipients include Margaret Mead, Peter Matthiessen and Meredith Monk. Read other articles by Keith, or visit Keith's website. This article was posted on Friday, April 5th, 2019 at 4:08pm and is filed under Genocide, History, Rwanda, Terrorism (state and retail).